If you have ever tried to scatter Fake Stones by means of Slope, you may have realised that it comes with quite an amount of secondary effects attached that are sometimes hard to deal with. The aim of this tutorial is, therefore, to present a method with only two Shaders that – nonetheless – provides immaculate results. First, we create a Fake Stones Shader, adjust it and furnish it with a Surface to our taste. In our example the Surface is only composed of a Power Fractal. We then add a Surface Layer that we plug into the Fake Stones Shader as a Blending Shader. Thus stones will only appear where the Surface Layer is white. We therefore choose the colour white in the Surface Layer and adjust Limit Maximum Slope and Fuzzy Zone at will. At last we have to choose Terrain Normal as a Slope Key in Slope Constraints. To simplify matters we have deactivated Fractal Breakup and deleted the corresponding Shader. 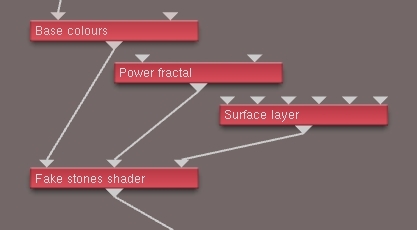 Important: Don’t assign any input to the Surface Shader! It serves as a replacement for the Distribution Shader that indeed serves the same purpose yet cannot be assigned a Slope Key. That can only be accomplished with a Surface Layer. Terrain Normal as a Slope Key means that the terrain is always taken as a basis for the calculation of the slope. If you, however, used Final Normal, the slope of the stones themselves would be considered for the colouring of the stones. As we limit the slope, however, only the flat/even parts of the stones would be colourised; that would look strange indeed. Questions and comments are, as usual, welcome! This is great thanks, think I was approaching things the wrong way round. Do you have any experience of dealing with rivers?